Midway through our crossing from South Georgia Island to Antarctica we pass the South Orkney Islands, a small group of islands that lie almost exactly between South Georgia and the Antarctic Peninsula, making them a natural place to pause during our crossing and make a landing to stretch our legs a little. 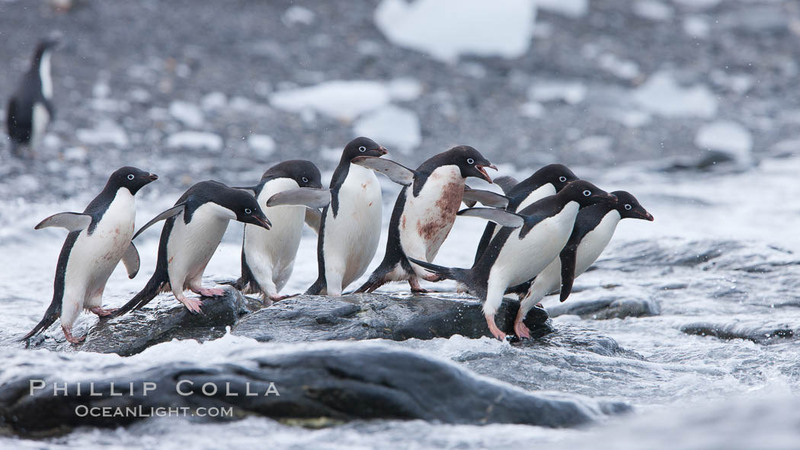 After our sunrise approach to Coronation Island, the icebreaker ship M/V Polar Star anchors and we go ashore at Shingle Cove to visit a colony of Adelie penguins (Pygoscelis adeliae). The colony is set atop a bluff above the ocean, subject to blasting wind and snow. The wind is so strong that it knocks a chick over now and then. 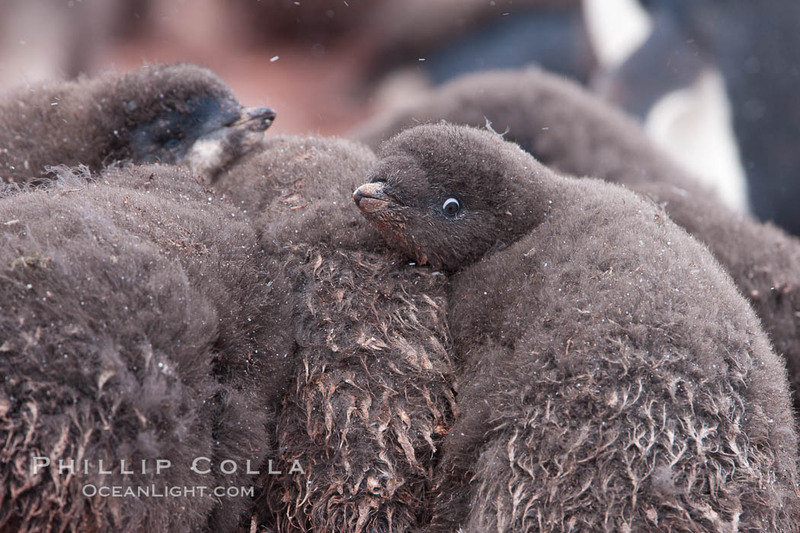 Many of the chicks are huddled together for warmth in creches. Adjacent to the bluff is a snow covered slope that the penguins descend to reach a cobblestone beach. The thousands of birds in the colony have worn dirty winding poop-covered paths in the snow. I spend most of my time on the cobblestones, watching the penguins pass back and forth. Entering the water is a dangerous proposition for a penguin, since leopard seals often patrol the shallows waiting to strike. So the penguins gather in nervous groups at the water’s edge, making a few false starts before one of the braver individuals finally commits and dives in. Immediately the rest of the group follows suit, rushing into the water in a chaotic sprint. As the waves washing in and out are hard to judge, some penguins mistime their dives and land head first on the rocks, only to pop back up quickly and try again. In a few seconds it is over – the rocks are empty. The departing penguins can now be seen porpoising at great speed out to sea to spend time foraging for food. Penguins returning to shore arrive in smaller groups or individually, but speed through the water in the same nervous way, ending their swim with a leap and an agile stand-up landing onto the rocks. 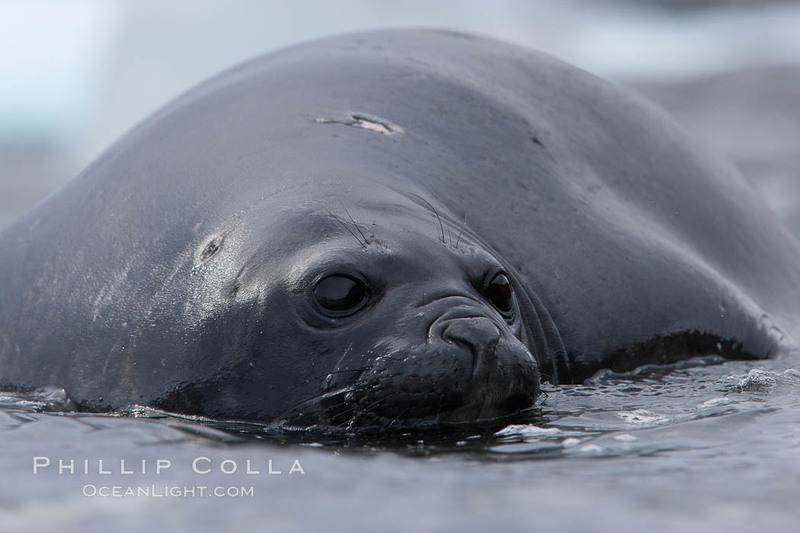 After a while I spot an elephant seal lounging in a pool on rocky reef. I spend some time laying on the rocks (uncomfortable) trying to photograph it at its eye level. I’m not sure I succeeded. After that, a visit to the nesting area is in order, to see the chicks and especially the adults feeding their young. On the snowy slope between the beach and the rookery I witness a southern giant petrel’s attack on a chick that ventured too far from the nest. The result is gory and tough to watch. The giant petrel does not dispatch its catch quickly. 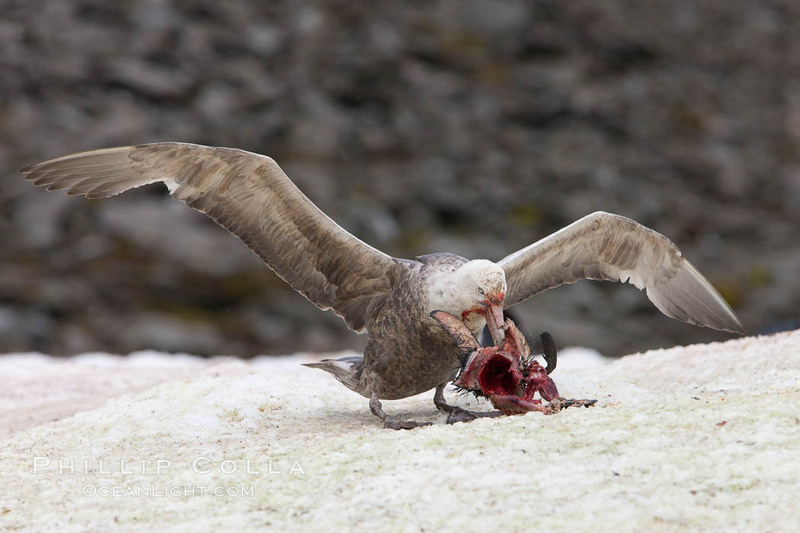 It takes about 10 minutes for the chick to die, during which time the skua consumes a good part of it. Afterward, all that is left is a tattered penguin carcass lying on the dirty snow and a blood-covered skua guarding its kill. The scene is not enjoyable to watch, but I do feel privileged to have witnessed it. It drives home the fact that the dramatic wildlife spectacles we are here to observe are a perpetual and unforgiving struggle for the participants. We leave Shingle Cove about midday, sailing along the South Orkney Islands for a while. Icebergs large and small pass by, set against the snow covered mountains of Coronation Island. One tabular berg that we encounter is measured by the ship’s radar at over 3 miles long. The thing is so large that it takes much longer to reach that expected, distance and size being quite difficult to judge in the clear dry air. 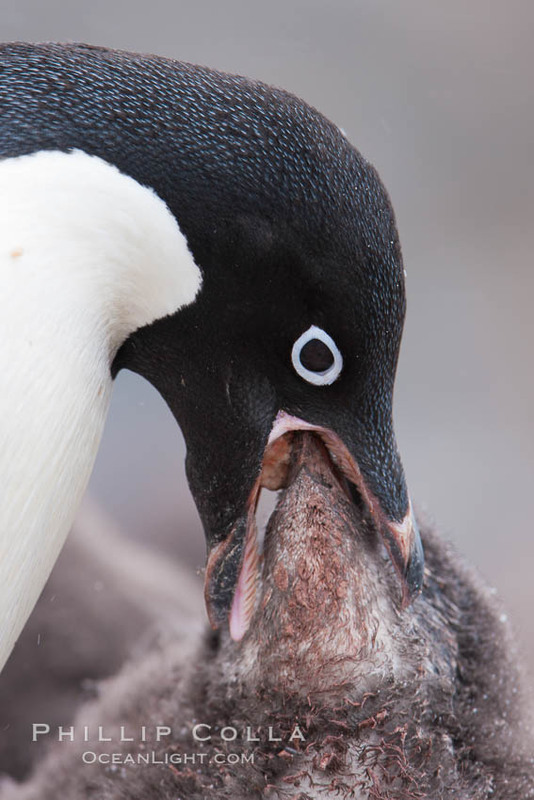 Adelie penguin, adult feeding chick by regurgitating partially digested food into the chick’s mouth. The pink food bolus, probably consisting of krill and marine invertebrates, can be seen being between the adult and chick’s beaks.